Moved by his encounters with destitute and homeless elderly, the Third Jamgon Kongtrul Rinpoche planned to found a home for them. Realising the impact of prolonged poverty and destitution on the human spirit, he put it quite simply that the Home will be “a place where minds will change”. On December 7th, 1995, the Home opened in Kalimpong. Three of the first 7 elderly were among those whom the Third Jamgon Rinpoche met on his first visit to Lava in 1987. The plight that moved him so deeply continues to be the reason for the Home. By 1997, the Home had 27 elderly residents. That year, the first 5 children joined. Two among them were blind. All were destitute. The elderly responded with keen interest and care. In turn, the children livened the atmosphere and lifted the spirits of the elderly. Great warmth settled in and since then children have become a part of the family at the Home. Today, 2012, there are 40 elderly and 51 children. 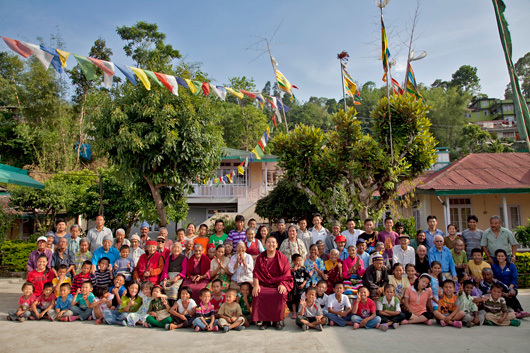 The children attend the Jamgon Kongtrul IIIrd Memorial School. Some have completed school and are now working. One among them is married, a blind girl achieved the state’s recognition for her academic achievements and is employed in Delhi. Open to destitute people of all races, castes, and creeds, the Home has realised Third Jamgon Rinpoche’s vision of a place where minds will change. Although its shrine room is reflective of the Buddhist organisation, all residents are encouraged to pursue their own religious beliefs. Staff and residents live together like a family. Through caring for each other and through the kind generosity of benefactors, everyone at the Home is given an opportunity for an improved life and a better future. The quality of life there will continue to be gauged by the contentment of its residents.